Plymouth Quest is a MCA Workboat 2 research vessel, owned by the UK's Plymouth Marine Laboratory (PML). Built in China in 2001, she was sold to PML by her Icelandic owners in March 2004 and entered service in June that year. 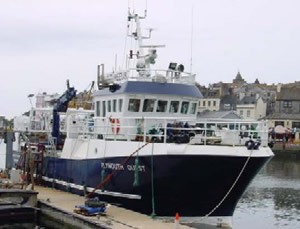 Plymouth Quest is the newer of two ships owned by PML and is used for biological, chemical and physical sampling in coastal seas. A robust and versatile vessel, Plymouth Quest enables trawling, hauling, dredging, towing, and equipment deployment, as well as oceanographic measurements. Laboratory facilities are available onboard. Plymouth Quest is capable of carrying up to 12 scientists and has an operational range of up to 60 miles from a safe haven. Cruises can be up to 5 days in length. In addition to the details provided in the CARBON-OPS data inventory, more information about RV Plymouth Quest cruises may be available via the UK Cruise Inventory.